On today's episode, I'm interviewing Sara Anna Powers, a Success Coach and Copywriter over at SaraAnnaPowers.com. Sara Anna is passionate about helping online business owners create magnetic messaging so they can get more leads and make more sales. After practicing law for 8 years, Anna transitioned into running her own online business and helping other entrepreneurs create bigger impact and make more income. She's helped multi-six, seven and eight-figure business owners create click-worthy copy and also created an eight-week online copywriting course. Anna also hosts a faith-centered mastermind and the Faith Forward Online Business podcast. How Sara Anna transitioned from being a full-time attorney of 8 years and left that world to be a full-time entrepreneur who helps multi-six, seven and eight-figure business owners create click-worthy copy. How Sara Anna believes your mindset is key when it comes to overcoming doubt and transforming into the role you are meant to take in your business -- and how Sara Anna overcame that herself. One of the biggest lessons Sara Anna had to learn in order to transform her business was how to say “no” to the mediocre, so she could say “yes” to the best. Sara Anna’s one tip on what she sees most people doing wrong when it comes to copy and the one thing they could tweak or change to make their message more magnetic and more powerful. If you heard a ton of great information listening to Anna today, I'd love to hear all about it! Take a screenshot and post it to your Instagram Stories with your biggest takeaways and tag me, @rachelrmcmichael! On today's episode, I'm interviewing Jen Casey a business strategy and mindset coach and the host of the Inner Boss Podcast. Along with running her business and podcast, Jen has certifications in NLP, EFT, Hypnosis & Time Technique. After building her own health coaching, group fitness, and NWM business, and identifying the gaps that prevented women from growing profitable businesses, Jen created her “Pitch to Your Niche Method.” Through her courses and programs, she blends her experience in online marketing with her love of psychology to teach network marketers and online coaches how to think like a top earner and turn their social media into sales. How Jen turned what was just an idea of online business coaching (before online business coaching was really a thing, way back in 2011) into a super successful online business for group coaching, network marketing coaching, and social media marketing where she has served thousands of clients and helped them grow and scale their businesses. About the time a former upline of Jen’s told her, “you can’t make money that way…” and how Jen took that as a challenge and ran with it. Jen’s tips for how to keep going in the online space even when you don’t feel capable, smart enough, or big enough -- and how to stay positive through it all, even through the ups and downs. How Jen teaches her clients to transform their mindset and overcome their fears so that they can transform the way they do sales on social media. If you loved listening to Jen today, I'd love to hear all about it! Take a screenshot and post it to your Instagram Stories with your biggest takeaways and tag me, @rachelrmcmichael! On today's episode, I'm interviewing Christy Westerfeld, Esq. is an attorney and legal resource for online entrepreneurs and coaches over at ChristyWesterfeld.com. Christy was offered an awesome job after law school and worked her way to the top, but there came a day where she said 'enough is enough - it's time to live life on my own terms!' ...and now she does! Christy now gets to spend her days with her two babies - her 14 month old son, and her growing business filled with amazing customers. Christy is SO passionate about teaching other female business owners all about the "legal stuff" - it doesn't have to be complicated, scary, or expensive, and is a HUGELY important piece to running a successful business. Christy is determined to get the conversation going about legal, and to change the stigma from "ew" to "woo!" about diving in to legal as an online business owner. Christy also prides herself on being relatable, real, and easy to talk to, unlike the stereotypical attorney many of us expect to find, and can't wait to help YOU legally protect your business, too! How Christy moved from corporate lawyer who was on the fast track to becoming a partner, to an online legal business coach (plus mom of two!) helping entrepreneurs everywhere safely protect their business the easy and uncomplicated way. Some of Christy’s tips on what entrepreneurs need to be doing now to protect their businesses. How Christy changed from a more “employee mindset” individual to an entrepreneur eager to help other women start and protect their businesses. All about Christy’s one page, free legal checklist and reference guide that she has offered to you on her website that helps you get protected legally, wherever you are at in your business! So whether you are building a website, working with clients privately, in the process of building an online course or a group coaching program, hiring employees, or if you’re in the stage of hosting an event-- this checklist can help you! If you found a ton of valuable information listening to Christy today, I'd love to hear all about it! Take a screenshot and post it to your Instagram Stories with your biggest takeaways and tag me, @rachelrmcmichael! On today's episode, I'm interviewing Christina Jandali, the business strategist and entrepreneur behind DeliverYourGenius.com. Christina is a confidence boosting, cash-creating, Business Growth Strategist who helps online business owners stand out, get seen, and create 6-figure profits using the power of Facebook groups. After becoming a millionaire in her mid-20’s (losing it and rebuilding it over again) and climbing the corporate ladder, she realized she was ready to build her own dream business, not someone else’s. She's since helped thousands of female entrepreneurs start, grow, and scale their online business while serving on the Forbes Coaches Council. She’s a mama of two and you can find Christina running, adventuring outdoors, drinking froo-frooey coffee, and hanging out with her family in Vancouver or in the chilly winter months, hiking and poolside in sunny Palm Springs. Christina’s back-story and how she moved away from the corporate world to become a Facebook Group guru that helps thousands of entrepreneurs grow, scale, and leverage their communities to convert sales from Facebook groups. About the struggles Christina faced to create the perfect system she has in place now and how she overcame them to now have a super successful, 6-figure business. How Christina did what so many other women in this industry are often afraid of doing: admitting what was going wrong, choosing to not do what everyone else was doing for the sake of being like everyone else, evaluating, and completely changing a program to work and serve people better (and doing all of this mid-launch AFTER people had already paid to be in her program!). What kept Christina motivated to keep going, evaluate, and change in the midst of a lonely struggle. If you were inspired hearing from Christina today, I'd love to hear all about it! Take a screenshot and post it to your Instagram Stories with your biggest takeaways and tag me, @rachelrmcmichael! On today's episode, I'm interviewing Allison Hardy, a business strategist for Mompreneurs and the creator of the Life by Design Podcast. Through infusing their business with a hearty dose of automation, authentic social media driven by Facebook Live, and stepping into the role of an influencer through email marketing, Allison helps women raise their businesses while they are raising their families, so that they can live life by design. Allison is the creator of the Life by Design Podcast, a Huffington Post Contributor, has been featured in YFS Magazine, and was named one of Washington, D.C.'s most influential professionals under 40 by Washington Life Magazine. She's also wife to Teer, and mom to four year old Camden and 8 month old Nora. The three ways Allison helps Mompreneurs raise their businesses while they raise their families: Automations, Social Media, and Email Marketing. Why Allison believes Facebook Lives are the way of the future when it comes to online businesses and her best tips for overcoming fear and anxiety before stepping in front of the camera. Allison’s take on Facebook Groups and how she’s mastered nurturing them, growing them, and keeping them inspired. 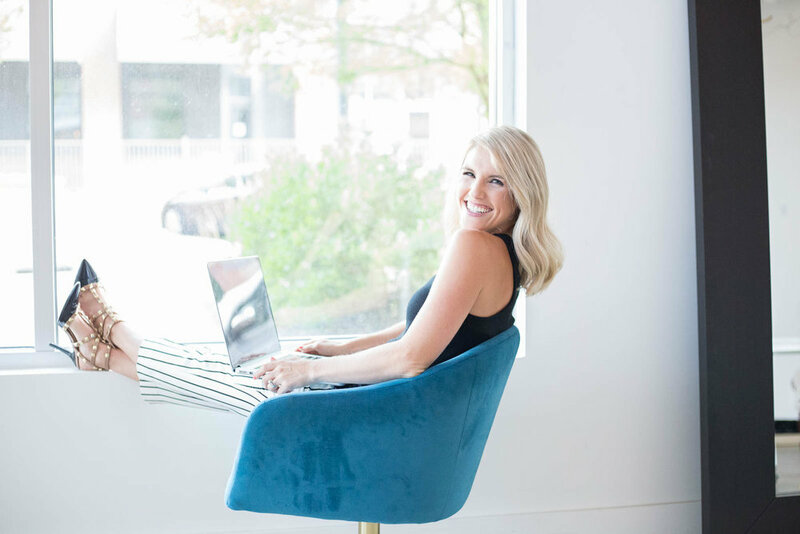 How Allison perfected the system she has in place now that really nurtures and supports her clients, how she overcame the obstacles to get there, and how she helps her clients do the same. If you loved hearing from Allison today, I'd love to hear all about it! Take a screenshot and post it to your Instagram Stories with your biggest takeaways and tag me, @rachelrmcmichael! On today's episode, I'm interviewing Haley Burkhead, the founder of Profit Planner, about the growth of her business and the impact the Profit Planner Lounge has on its customers. Haley Burkhead is the Founder of Profit Planner and host of the Profit Planner podcast. She helps emotionally drained, workaholic women find which tasks drive profit so they can transform the hamster wheel they call their business into something simple and automated. Haley is a consultant, podcaster, speaker and educator who has been featured in the Huffington Post, Thrive Global Magazine and Radiant CEO. Find free productivity and profit secrets at profitplanner.co. Haley's back story and how she got started doing what she loves-- helping entrepreneurs step into the CEO role of their businesses. How Haley actually took a job to escape the chaos of her entrepreneurial life that was making her sick (wow!) and how that season taught her the best ways to run and simplify her own business. "I was so overworked that I actually took a job to escape entrepreneurship because just hated being a business owner. And I thought all entrepreneurs had to work that hard...I just didn't understand why people had successful businesses without running themselves ragged." How Haley overcame the fear of loneliness (that many entrepreneurs face) and really took control of her thoughts, her life, and her business in order to become a successful business owner! Haley's heart and mission, which is helping people prioritize themselves, while giving them time and financial freedom. "I think a lot of us don't think about what would actually make us happy. And I think the reason why is because we don't have either time freedom or financial freedom or both. So if I can help someone have financial freedom and time freedom, they'll be freed up to where they can figure out, "what do I want?" If you loved hearing all about Haley's story and journey, I'd love to hear all about it! Take a screenshot and post it to your Instagram Stories with your biggest takeaways and tag me, @rachelrmcmichael! On today's episode, I'm interviewing my mentor, coach, and good friend James Wedmore about the growth of his business and the impact he is making on digital entrepreneurs and CEOs everywhere. James Wedmore is an introvert from Laguna Beach, CA who has spent the past 8 years teaching online entrepreneurs how to leverage the power of online video and YouTube with such courses and programs like Video Traffic Academy and 48Hr Film School. Starting in 2016, he made a massive shift to focus on a big gap that he saw missing in the marketplace: The Mindset of Entrepreneurs. He launched a podcast (Mind Your Business) and a new flagship program (Business By Design) to help other content creators, authors and coaches thrive online. James also facilitates a high-level mastermind called The Inner Circle (which I’m a member of). When James isn’t working, he can be found surfing, traveling with his beautiful wife or restoring his old Volkswagen. His motto is simple: Work hard, play harder! "Forbes released a stat a year or two ago saying, 'eight out of 10 businesses fail within the first 18 months.' Maybe this is why people have given up in their mind before they've even started-- They didn't really believe in the vision, in the outcome. They didn't really say, 'no matter what, I'm going to do what it takes, I'm going to find a way.' And that's really what I help entrepreneurs with." If you are an entrepreneur and were pumped up hearing from James, I'd love to hear all about it! Take a screenshot and post it to your Instagram Stories with your biggest takeaways and tag me, @rachelrmcmichael! On today’s episode, I’m interviewing Jasmin Niemiec, the business coach and mentor from CoachJasmin.com, about how she stands out boldly as a leader and how she is able to have such an amazing impact on her team, all while maintaining the growth of her business. Jasmin Niemiec is the Business Coach and Network Marketing Mentor behind CoachJasmin.com. She helps Moms build a business from home that allows them to replace their salary and be home with their kids. She has built 6 figure businesses in the health, social media consulting, and soon to be beauty industry through her recent Luxury Hair Care Partnership, where she has built an organization of nearly 2,500 other business builders and healthy hair activists. She currently lives in Michigan with her husband Joe, daughter and son (with baby 3 on the way! ), but is soon moving to South Carolina, to allow her husband to train on a professional running team, in hopes to qualify for the Olympic Marathon Trials 2020. Jasmin loves quality time with friends and family, big salads (but also donuts), all forms of exercise (especially running) and spending time outside. Jasmin’s amazing backstory and how she went from a classroom teacher to a 6-figure business owner. How she maintains 3 online businesses while being a mom of two (soon to be three! ), a wife, and a still enjoys her favorite things day to day. How Jasmin finds it within her to step out of her comfort zone and really make a lasting impact on the people she serves and who are on her team. Jasmin’s thoughts on how she conquered her fear of using her personal social media pages (alongside her business page) to build her businesses and reach more people. On today’s episode, I’m interviewing Stacy Tuschl, the founder of She’s Building Her Empire, about the growth of her business and how she does it all as a mom, an entrepreneur, and a studio owner. Stacy Tuschl is the founder and creator of She’s Building Her Empire where she helps empower women to raise their standards in business and in life. Stacy started her first business in her parents’ backyard and turned her hobby into a 7 figure company she still runs today. Stacy is a podcaster, bestselling author, wife, and mom of 2. If you loved this episode and were encouraged hearing Stacy’s story, I'd love to hear all about it! Take a screenshot and post it to your Instagram Stories with your biggest takeaways and tag me, @rachelrmcmichael! On today's episode, I'm interviewing Michelle Myers, the founder of she works His way, about the growth of her business and how she prioritizes making an impact in her field. Michelle had no idea what started as a Google hangout at 5am with three friends would one day result in the title of "founder" of she works His way. But here we are, almost five years later, with hundreds of women gathered for the same reason we started: How can I glorify God, honor my family, and serve others at work? She's the creator of Network Marketing Nobility and the swHw Business Tracker, the author of Famous in Heaven and at Home, and a certified StoryBrand Guide and Copywriter. Basically, her work happy place is pulling out of others what God already put in them. Home will always be her favorite place to be, which is wherever her family is: her husband, James, and their three children, Noah (7), Cole (4) and Shea (2). How Michelle took what was just a simple social media account for community and inspiration and turned it into a huge platform for women entrepreneurs to build their faith and their businesses. Michelle will share her best tips and advice on how to deal with unexpected bumps along the road in the entrepreneurial journey. "I think the first thing to recognize is that you're human and so you're not going to be perfect and so don't expect that it's all going to go to perfection." She continues, "if you constantly battle and cave to the preferences of people rather than really staying committed to the purpose of why you begin you're never going to build a business that satisfies anyone." How Michelle stays grounded and authentic in a social media driven world where being misunderstood happens all too often. You'll also hear how Michelle balances real life vs. social media-- recognizing that social media is essential to her business but that our daily lives outside of that are also so important. "I plan as much of my social media content ahead of time as possible...so I do have lots of screen free and scroll free time installed in my life to where when I come to social media, I'm happy and excited to interact with the people that I follow and connect with there." I conclude the interview by asking Michelle what the phrase, "making an impact," means to her business and to her personal life-- and her answer is so, so good! If you loved this episode and found inspiration hearing about Michelle's journey, I'd love to hear all about it! Take a screenshot and post it to your Instagram Stories with your biggest takeaways and tag me, @rachelrmcmichael!